Unfortunately this is a common problem with many dashboarding applications. Typically, the dashboard designer will customize the queries and metrics for each dashboard view. This requires the time consuming act of tracking down the designer each time there is an organizational change or strategy shift at your company. You can see how your dashboards start to deteriorate like the food in the back corner of the office fridge. Here are some things you can do right now to help save your dashboards from the compost heap. Book some time with your designer and make those needed changes! The best solution for keeping your dashboards up to date is to have an easy method of keeping your metrics views updated without the need for developers. For this you will need the ability to change metrics on the fly as the user’s needs evolve. This will keep your dashboards relevant, useful and engaging to your users. Once you see the power and flexibility this provides, you will wonder how your organization got along without a complete metrics management strategy in the first place. The solution that PureShare has developed to deal with these issues is called the Metrics Catalog. This is a comprehensive system-of-record for the universal definition of all metrics across all your systems and data sources. It allows the company to quickly make changes and combine and make calculations on the data source with simple catalog changes. It does this by standardizing your metrics and dimensions across the organization so as to provide fresh timely accurate metrics for everyone. The hope is that you have clean consistent data classifications across your organization, but often this is not the case. With the ability to combine data from data sets across the business, comes the challenge of having different classifications used by each department. For example, at a call center, Group A calls their dropped calls one thing, while Group B calls them something else. A great feature of the Metrics Catalog solution is the ability to help you standardize your metrics across disparate data sets. It can help unify and roll up data that is often very tedious to work with. Now a complete story can be told through metrics gathered and presented all in one place. Imagine that! The added benefit of your “like new” dashboards is the time savings they provide your organization through automation. The Metrics Catalog can self-refresh data so users always see timely, current information. Just think about what you can do with all the time saved with not needing to build spreadsheets and gather reports. Take a cruise, hit a few rounds of golf? Ok, maybe not, but it allows your teams to focus more on strategy and core activities and less on manual repetitive work. You can start to think about what the numbers are telling you and make decisions immediately rather than weeks from now. The metrics that before took weeks or months to roll up will now be gathered in near real-time and presented to the business stakeholders! Much like how eating healthy fresh food is good for your ecosystem, fresh metrics are also great for your business to ingest on a daily basis! Keep your business running smoothly with timely actionable metrics that don’t let your dashboards lose their flavour. Find out more about the PureShare Metrics Catalog here. 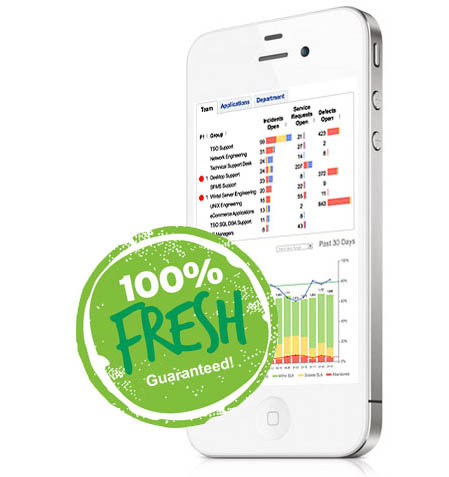 Contact PureShare today if you have any questions about keeping your dashboards fresh.